DJs Nitrogen and Noise will keep you dancing until bar close. Also spinning will be special guest DJ BigKev. Chicago’s I:Scintilla (pronounced “eye-sin-til-uh”) return to Minneapolis following their electrifying performance at The Varsity Theater opening for The Cruxshadows in 2008. Chicago’s I:Scintilla (pronounced “eye-sin-til-uh”) have spent the last eight years on a constant pursuit of musical exploration and artistic refinement. Never happy with genre boundaries, the quartet has taken its metal-infused electronica signature and drawn in elements of synth pop, trip-hop, and indie electro. Their latest effort, “Dying & Falling” (2010), masterfully blends such influences into an intelligent collection of powerful, introspective, and catchy songs. From the intense dance-rock of “Swimmers Can Drown” to the thoughtful down-tempo groove of the title track, the album pleases on many levels and is a testament to the band’s maturity. Their upcoming fourth album is an ambitious continuation of their musical travels and is set for release in summer 2012. The band is led by dynamic frontwoman Brittany Bindrim, whose words, melodies, and soaring vocals have resonated with a devoted and growing fan base. Rounding out the lineup are Jim Cookas (guitar/programming), Vincent Grech (drums), Brent Leitner (guitar/programming) and Brandon Chase (bass). Over the years the band has established a solid reputation as a live act with their high energy shows that feature a mix of rock and electronic elements. I:Scintilla formed in 2003 and quickly established an affinity for pushing musical boundaries while maintaining pop sensibilities. The result was their self-released debut album, “The Approach” (2004). Through relentless promotion and a strong online presence, the group soon attracted attention from established indie labels and eventually signed with Belgium-based Alfa Matrix in early 2006. Their first set of releases included the EP “Havestar” (2006) and full-length album “Optics” (2007). Both efforts managed to chart on Germany’s Deutsche Alternative Charts (DAC) with the former reaching #13 on the singles chart and the latter #6 on the albums chart. 2009 saw the release of the DAC-charting EP “Prey On You” that featured three new studio tracks and five club remixes. Other notable accomplishments include festival appearances in the United States and Europe, most notably at Dragon*Con in 2010 and Germany’s Wave Gotik Treffen in 2007. They also appeared on the long-running independent music program JBTV in 2007 and have been featured in nearly every alternative music magazine in Germany and several in England, Belgium, and Italy. In 2008 the band hit the road with darkwave mainstays The Cruxshadows for an extensive three-month U.S. tour that brought their live show to every corner of the United States. Thought Thieves are a computer free/human friendly synthesizer band from Minneapolis, Minnesota. This five piece backing track and laptop free outfit is focused on making interesting, thought-provoking and exciting music. Their first EP, “All I Pretend”, debuted in April 2009 and Thought Thieves have been gaining a following through frequent gigging. The band’s follow-up EP, “Krista”, launched in April 2011. The group has been featured in the Twin Cities Electropunk compilations and has opened for national acts like Lords of Acid and Anything Box. Completing the line-up is St. Paul’s own Cwn Annwn. Dynamic vocals? Check. Powerful melodies? Uh-huh. Shredding twin leads? Absolutely. Crunchy heavy metal goodness? In abundance. It’s easy to understand why Cwn Annwn has become once of Minnesota’s most respected metal acts. Two critically acclaimed albums paved Cwn Annwn’s way into Minnesota’s most prestigious venues, including the First Avenue Mainroom, Triple Rock Social Club, and Station 4. Having shared the stage with some of the industry’s most influential names, including Trivium, All That Remains, Iced Earth, Fair to Midland, and Chimaira among others, Cwn Annwn is primed and ready to take their place in the heavy metal elite. For more info (and to learn how to pronounce Cwn Annwn), check out www.cwnannwn.com. 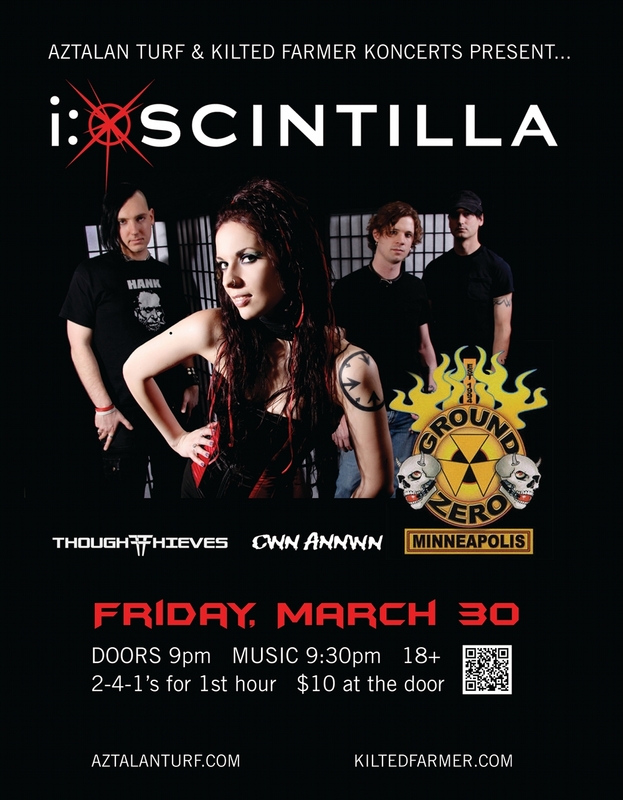 This entry was posted in Past Shows and tagged concert, cwn annwn, electronic rock, ground zero, i:scintilla, industrial, metal, minneapolis, synthpop, thought thieves. Bookmark the permalink. Golden Age of Minnesota Music?